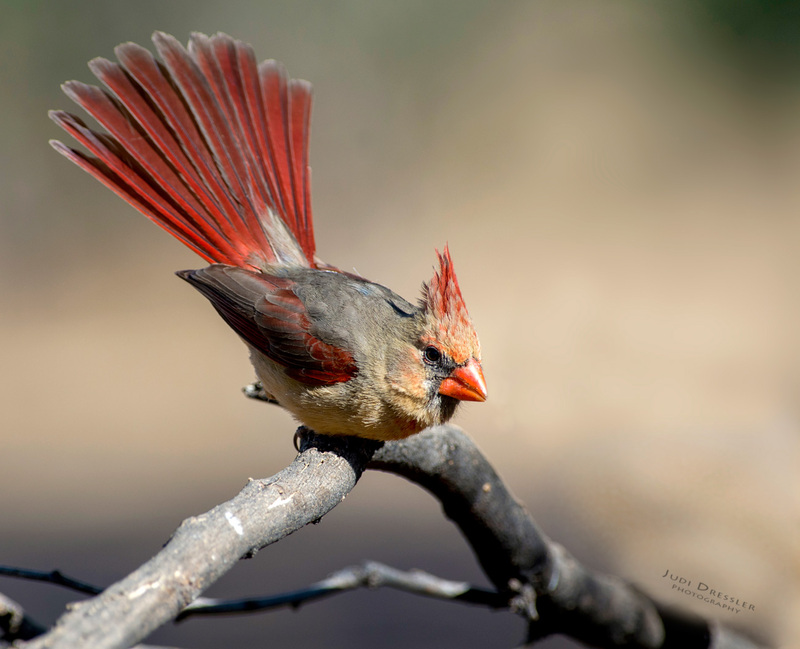 This beautiful female Northern Cardinal spread her tail feathers in an alluring manner, signifying to the males that she was available for love. It was spring time in Arizona, and time for nesting, after all. I watched from my slightly hidden position as she hopped from branch to branch and finally settled on this one for a little while. A perennial favorite among people, the Northern Cardinal is the state bird of seven states. The distinctive crest can be raised and pointed when agitated or lowered and barely visible while resting. You typically see cardinals moving around in pairs during the breeding season, but in fall and winter they can form fairly large flocks of a dozen to several dozen birds.